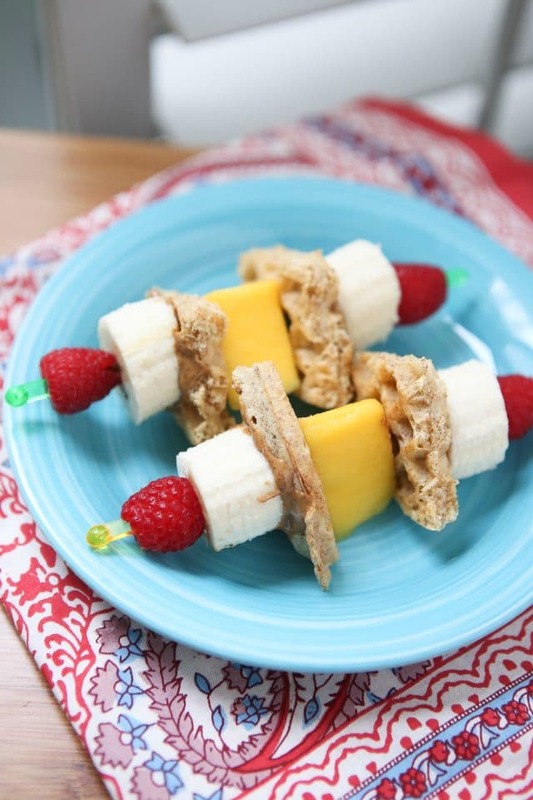 These Breakfast Fruit Skewers were inspired by my friends at Produce for Kids. It’s that time of year again – I’m happy to partner up with Produce for Kids to promote their healthy-eating focused campaign with Publix Super Markets. Last year’s campaign was able to provide 2.2 million meals to local families in need – that is pretty incredible work! Here’s how it works, the Publix and Produce for Kids campaign runs June 2 – June 29 and is supported by 13 fresh fruit and vegetable suppliers. With each Publix store purchase of any of these fruits and veggies from the supporting brands (see image for a list below), funds are donated to local Feeding America food banks. To stay up to date with campaign happenings be sure to join the Produce For Kids Campaign Page on Facebook (you’ll also have the opportunity to win $100 gift card to Publix!). 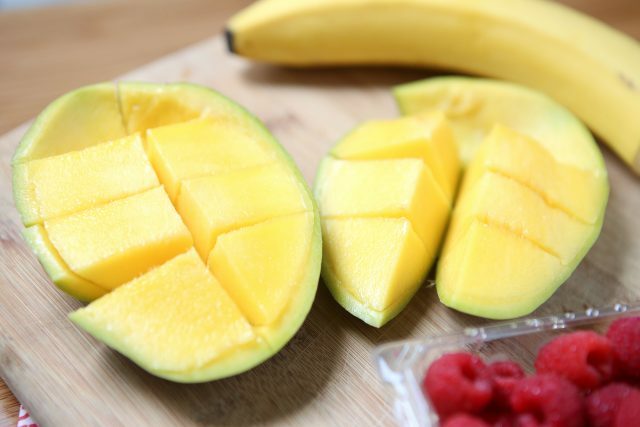 My heart is always behind any program or organization that promotes healthy eating and provides aid in feeding hungry families…this is why I love everything about Produce for Kids! Please support them any way you can – look for signage at your local Publix, find recipes on their website and and tag any healthy creations and ideas with #produceforkids. If you have been reading my blog a while, you may have noticed by now that I typically don’t make “cute” food. I like cute food, but I don’t have the knack or shall I say talent for making food cute. I just make food food. 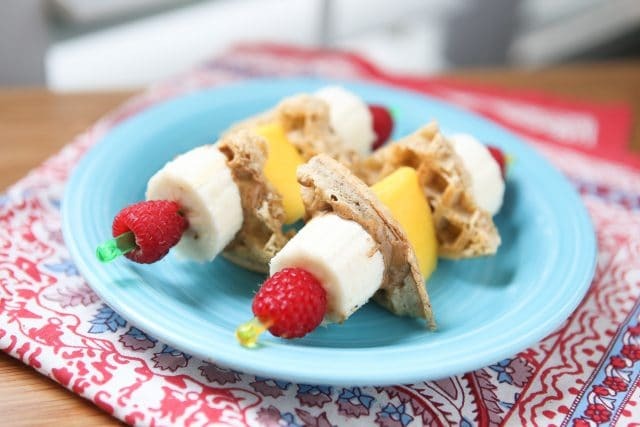 However, when I spotted these Sunny Breakfast Fruit Skewers on the Produce for Kids website and in the Healthy Family Classics Cookbook (don’t forget to enter to win a copy of the cookbook here! ), I knew I could pull them off. What better time is there to make cute food than summer when kids are home and we have the luxury of a more relaxed schedule? 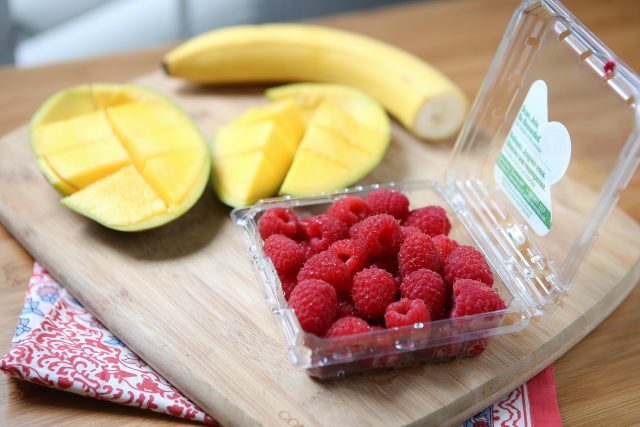 These were obviously easy to put together and with the Produce for Kids Campaign at Publix going on right now, I am happy to know my mango and raspberry purchases are helping towards providing meals for those in need. What I love the most about this campaign is how it encourages us to purchase more fruits and veggies that will support the campaign, but in reality it’s also encouraging us to eat healthier – I call that a win-win! I can’t even tell you happy my kids were with this fun little breakfast. The smiles on their faces were priceless and it was a great reminder that I should try to make “cute food” more often! Spread almond butter on each waffle quarter. 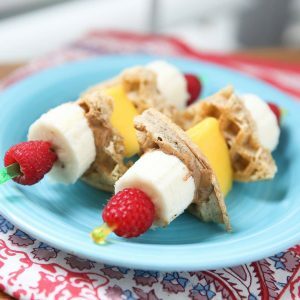 Thread each skewer with 2 raspberries, 2 banana slices, 2 waffle triangles and 1 piece of mango. Drizzle with honey and sprinkle with shredded coconut if using. Feel free to change up your skewers to your family's tastes and adjust amounts and varieties of fruits. Use plastic beverage stirrers as an alternative to wooden skewers. Recipe very slightly adapted from Produce For Kids.